I remember the days of hardly being able to keep my eyes open because the night had been a long one. Full of ups and downs, cries tearing me from my warm and cozy bed. I remember the horrible tantrums that sometimes occurred because of offering the wrong color shirt or putting juice in the cup with a red ball instead of the one shaped like a dog. And I remember the effort of disciplining myself to not give in to the tantrums, even though on most days giving in would have been much easier. I remember the days of trying so hard to teach my toddlers how to put their toys and clothes away, only to turn around and see everything in a pile on the floor once again. And I’ll never forget the time I let them try to pour the chocolate milk themselves and the milk jug fell so hard on the floor that it splashed up to the ceiling. I want to encourage you moms to keep going. Keep doing what you are doing, even though right now it may seem pointless and fruitless. I am currently on the other side of babyhood and toddlerhood—at the pre-teen and teen years. I am enjoying all the fruit of my labor from those early years. The nights of being awakened by a crying baby have been replaced with fun nights of staying up late to watch a movie and play games with a teen. The horrible tantrums have been replaced with a pre-teen who truly understands that he will not always get his way, and who understands and accepts compromise. The Sundays and Wednesdays of wiggly children have been replaced with children who like to discuss the sermons and who enjoy Gospel Meetings and Lectureships. 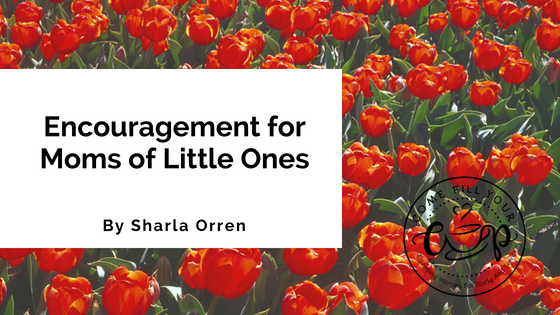 I want to encourage you while you are in the midst of these crazy, chaotic days. Take moments throughout the day to take snap-shots in your mind. Use all 5 senses to really be present with your child. Notice those wide eyes and chubby hands. Listen to how your baby says words that are not quite correct or enjoy hearing him say, “Mama.” Really absorb and feel those tender hugs and sticky kisses. Smell the sweet baby smell that everyone loves so much. Snap-shot those moments so you can keep them in your mind as your children grow older. Enjoy those moments with your children, because those moments will become precious memories. Now that I am an “older” woman on the other side, I can say that it is such an encouragement for me to see moms who bring their little ones to church. I remember how hard it is and I know the struggle. I know that there are sometimes hurtful comments made; but, rest assured that for every hurtful comment, there are many more people who love you and that are encouraged by you. I also want to encourage you to understand that you don’t have to be perfect or be perfectly put together. No one is perfect, no matter how they seem. There is a great truck commercial that I just love! The ad is for new (perfect) trucks; but, the point of the ad is for people who own the trucks to tell the stories about what made the dings and scratches on their trucks. They are embracing the fact that their trucks are not perfect. It is neat because they are sharing what makes their trucks unique and different from the others. Embrace the quirks of your family. Tell the stories about what makes your family not perfect, but unique. One of the things that I hear most from moms with really young children is that they have no time for Bible Study or prayer. I understand how hard it is. If you can just get in a little time here and there it will be worth it. 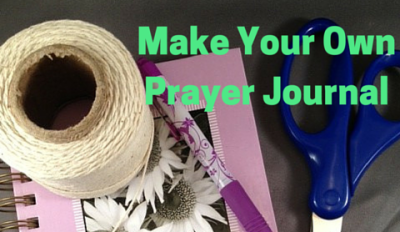 One thing that I have found helpful to my prayer life is to have a focus subject for each day. Monday I pray for friends and family; Tuesday I pray for my children; Wednesday I pray for my husband, and so on throughout the week. I also keep a prayer notebook (nothing fancy) where I write down the things that I am praying for and keep the list to use every time I pray. This resource helps me to stay focused. I really like Bible Marking because I can pick a subject and stay focused on that particular subject. I have actually been going through and highlighting the verses. Don’t worry about starting with January—I am behind and trying to catch up myself. I am determined to get through this plan even if it takes me longer than this year to do it. 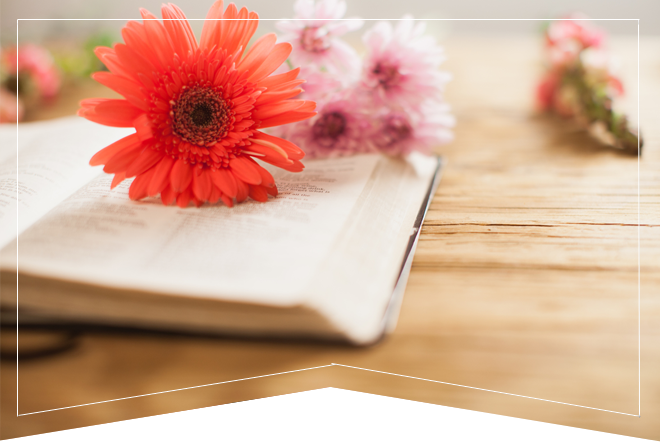 Kathy Pollard started a group with women who are currently writing The Book of Psalms. The goal is to write one Psalm per day; but, I am slower than most people, so I have been doing ½ a Psalm per day. It is ok, though, because I am gleaning a lot from what I do write. And you don’t have to write Psalms. Pick a book in the Bible that you feel would most benefit you. Even a small amount of prayer and Bible study every day will be very beneficial for your daily life. Be encouraged and know that even though there are hard days, these days will pay off in ways that you may not be able to imagine right now. Keep going! It may not seem like it, but your precious babies are learning so much and they are going to grow into adults that you will be proud of. Sharla Orren lives with her family in Camden, Arkansas, where her husband, Robert is the Pulpit Minister of the Cullendale church of Christ. She loves homeschooling her two boys, ages 15 and 10. She has a BA degree in Sociology. She enjoys writing for CFYC, Molly Green Magazine, The Old Schoolhouse, Queenly Quest, and various other publications. She also enjoys speaking at Ladies Days and Girls Days. You can check out her blog at http://www.lookatwhatyouareseeing.com in which she writes about homeschooling, natural living, homemaking, and time management.